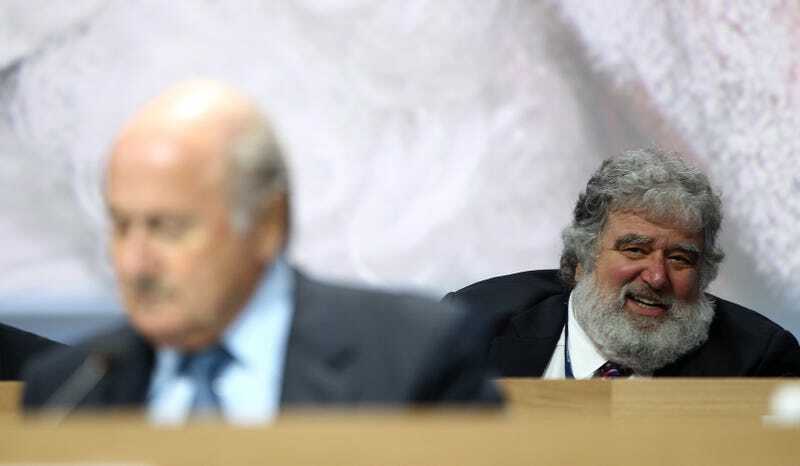 Chuck Blazer—the former FIFA exco member and CONCACAF general secretary who proved that Americans can be just as venal as any other soccer executive, but whose cooperation with the feds helped lead to May’s arrests and indictments—has been banned for life, effective immediately. Mr Blazer committed many and various acts of misconduct continuously and repeatedly during his time as an official in different high-ranking and influential positions at FIFA and CONCACAF. In his positions as a football official, he was a key player in schemes involving the offer, acceptance, payment and receipt of undisclosed and illegal payments, bribes and kickbacks as well as other money-making schemes. He was found guilty of violations of art. 13 (General rules of conduct), art. 15 (Loyalty), art. 16 (Confidentiality), art. 18 (Duty of disclosure, cooperation and reporting), art. 19 (Conflicts of interest), art. 20 (Offering and accepting gifts and other benefits) and art. 21 (Bribery and corruption) of the FIFA Code of Ethics. All of this is undoubtedly true. Blazer is a con man like all the rest: living lavishly off commissions from backroom media deals and taking bribes in exchange for his vote and influence. His high life was probably best captured by the fact that he kept two apartments in pricey Trump Tower—one for him, and one for his cats. It was Blazer’s lifestyle that caught up with him. He failed to pay income taxes for more than a decade and ended up on the radar of the IRS and FBI, who flipped him as an informant in their larger investigation of FIFA corruption. Evidence gathered by Blazer—who at points wore a hidden microphone to record FIFA exco meetings—led to the Zurich raid, and ultimately to the resignation of Sepp Blatter. Blazer himself pleaded guilty to 10 counts, according to his recently unsealed indictment, including income tax evasion, racketeering, wire fraud, and money laundering. Don’t let his charming blog or Santa Claus looks fool you; he’s one of the bad guys. As part of Blazer’s plea, he was forbidden from returning to FIFA, so today’s ban is practically meaningless. But it’s symbolic enough. No angel or crusader was ever going to take down a ship as thoroughly rotten as FIFA. It was always going to require one of its own rats trying to save his own skin.